Like I mentioned yesterday, I recently took advantage of one of those fabulous daily deals from Graveyard Mall. I got 9 pairs of name brand women's sunglasses less than $2 each. What a great deal! And I'm giving 3 pairs away to YOU! I gave the first pair away yesterday, and now I have two left. The second giveaway is for this super fun pair of Riviera women's sunglasses that originally retailed for around $26. There are no tags on this pair, so they are ready to wear! 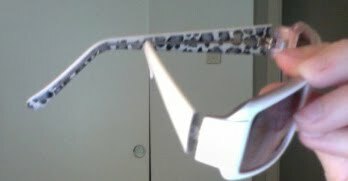 They are white and have a purple tint to the lens, with purple and leopard print on the inside (see below). This giveaway will end at 10:00 AM on Wednesday, August 11, 2010, and the winner will be announced sometime tomorrow.